Internationalization has become a major part of university’s strategy. Equal and quality higher education for all is one of the major challenges of 21st century education. With the tremendous opportunity for growth, students are expected to experience the excitement of traveling abroad, learn new skills and knowledge from a new perspective, discover the beauty and history of radically different traditions, take challenges to engage innovations and fashion possibilities in our globalized world. Short course abroad is a unique opportunity to focus on particular topic in more depth and to experience teaching from world-class academic staffs. Apply for short course abroad now and realize your inner strength to reach out, connect, and impact others from different backgrounds! For program details, please download Short Course Abroad 2016 Information below. Join us for an on campus Information Session to learn more about this Short Course program. Feel free to bring friends – everyone is welcome to attend this FREE event! Application deadline varies between respective short courses. Please refer to the short courses website for the deadlines. 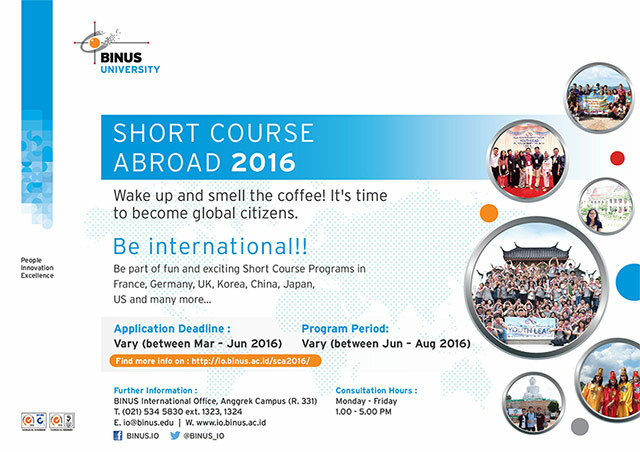 Get all the information you need about the program in the Short Course Abroad 2016 Information above. Should you need further information, feel free to contact us via email to io@binus.edu or visit us within consultation hours (Monday – Friday, 1 – 5 pm). Complete the payment by following the given instructions on the website. Q: How do I apply for the summer or short course? A: Some universities require online application. Others prefer the applicants to apply manually and send the documents through post mail. Go to the website of the university to make sure their preference. The details of how to apply are usually explained in the website. Q: What are the requirements to be eligible for applying short course? A: The requirements are basically explained in the website of the university. Contact the university for any inquiries. Some universities require certain level of language skills. Q: Can I transfer the credits from the short course to BINUS University? A: This will be determined by your program/department. You are advised to consult your program/department for approval before applying for the short course. Q: Can I get waive of attendance to join the short course program? Attendance waive during the regular semester is possible upon some criteria. Please contact Ms. Vidia Panna (vpanna@binus.edu) or International Office for more information. Attendance waive is NOT available during the compact semester (Semester Pendek). Please contact Ms. Dwita Ulibasa Harahap (dharahap@binus.edu) or the Overseas Program (in Student Services Center) for more information. Q: How much should I pay for the program? A: It depends on what are included in the package offered by the university. Some universities divide the fee into mandatory fee and optional fee. They may charge you only the tuition fee, while others may include accommodation and meals in the program fee. A: If you have to transfer money, you should make a full payment. It means you also have to pay any charge for the transfer. Go to your bank to get valid information on how much he fee to transfer certain amount of money to overseas bank. Q: Is there any scholarship for the program? A: Some universities offer discount price if BINUS is a partner university. For scholarship information, refer directly to the university website. Q: How do I go about applying for a student visa? A: After you give the university your confirmation of registration and clearance of payment, the university will send you Letter of Acceptance (LOA). You must go to BINUS International Office to register yourself as outbound student. BINUS IO will write a sponsor letter for you and can advise you on the visa application. The length of visa application varies based on which country you are going to. It can take between 1-4 weeks to obtain a visa. Please check the country?s visa information on their official website for details (refer to Consular Service section).